Do you have a minute to spare to learn some English? 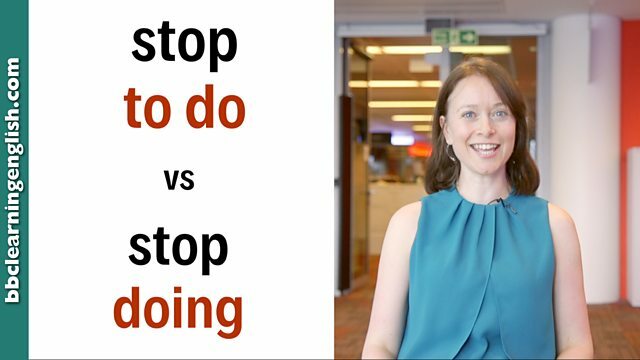 Then join Sian, who has a quick and simple lesson about the difference between stop doing and stop to do. Give us 60 seconds and we'll give you the English! Hi, I'm Sian from BBC Learning English. What's the difference between stop to do and stop doing something? Well, stop what you're doing right now because that's what I'm going to tell you. When we use stop plus ING, the activity in the ING form stops. So, I have stopped drinking coffee. I'm not drinking coffee any more, I'm only drinking water. Right I'm going to stop talking now. Write me a comment and tell me something that you've stopped doing. Stop can be followed by an ING verb or a full infinitive verb. This is called a verb pattern. Which form is chosen depends on the speakers meaning. When stop is followed by an ING verb, it is the activity in the ING verb which is stopped. John has finally stopped smoking. You won't see him doing it any more. After about an hour, they stopped playing football and rested. She's stopped making that mistake now and her language is much better. When stop is followed by a full infinitive verb, it is another action which stops. The action in the full infinitive is the reason why. I was watching TV but I stopped to do some homework. After about an hour of playing football, they stopped to rest. I had to stop to change a tyre. One of mine had been punctured. Stop and ING describes the action which is stopped. Stop and infinitive describes the action you began after stopping something else. Which of these sentences means that 'playing football' is the thing that's stopped? In which of these sentences does the speaker tell us that they began eating?